President Obama is going to have to break his campaign promise and raise taxes on Americans making under $250,000. There's really no way around it. The tax code is also loaded up with spending on things like itemized deductions. And while I agree with the goals of many of these deductions, like homeownership or charitable giving, we cannot ignore the fact that they provide millionaires an average tax break of $75,000 while doing nothing for the typical middle-class family that doesn't itemize. If the White House keeps its campaign promise, tax rates on the rich will go from a historical low to a historical high in a few years. The top 3 percent of tax payers, who contribute about $700 billion a year in tax payments, would be tapped for an additional $2.3 trillion in tax increases over the next decade, in the form of higher income rates, lower tax deductions, and new Medicare taxes. Would this kind of tax increase destroy America? Maybe not, said Roberton Williams of the Tax Policy Center. "My gut sense is that there's enough money up there that we can raise rates through the range without killing these people. But it's not ideal either." 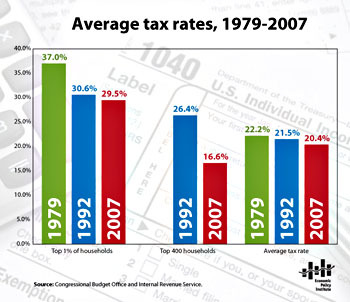 The Center on Budget and Policy Priorities, a center-left think tank, concluded that the only way to raise enough revenue to close the debt gap was to allow the entire Bush tax cut to expire in 2012 ... even though it would mean higher taxes for every filer and $1,000 less in after-tax income for the typical taxpayer. "If you want to reform tax expenditures intelligently, you shouldn't be running it through the top two percent," Robert Greenstein, the president of CBPP, told me. "I think we should let all the Bush tax cuts expire at the end of 2012. The big enchilada is health care but we can't change it dramatically in the next ten years. Tax increases buy you time." Of course, the rich are different from the rest of us: They have a lot more money and they see most of the gains of income growth. Any sensible tax reform should begin with raising the effective rates at the top before we gradually lift rates for the middle class. But the fact is the United States has, for the last 30 years, promised better benefits with lower tax rates, and the inevitable collapse of that promise is growing nearer. We all paid a little bit more in 1999. We could afford it then, and we can afford it again. Let's have real tax reform that gives meaning to the term "shared responsibility." It's time for the president to break his promise.